Up and walked Mix before breakfasting in the farmhouse. Joined David and helped him run power cables from the Stables to the Bothy before he went off for another appointment. I started to make some sense of all of the computer mayhem I have been through last week before driving Rachel to Duns to get her Bongo which had successfully completed its MOT test. I visited the bank to sort out my finances and then returned to Mount Pleasant where Rachel and I started to sort out the Hen House because David thought that he had seen a squirrel there. It may be so but we haven’t found it yet. It will provide the impetus to have the hen house cleared more quickly. 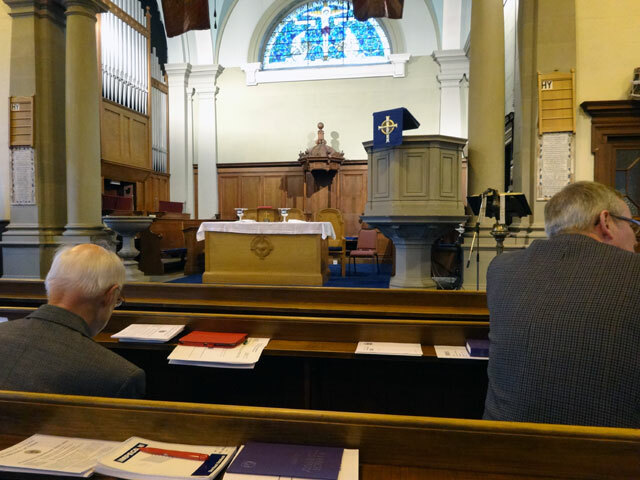 Late in the afternoon I showered, grabbed something to eat and then drove to Coldstream to attend the first meeting of the session of Duns Presbytery. There was little business apart from the service and I was taken aback by how few people were present. I drove home in time to listen to the latest referendum debate on television. It reminded me that when I was in Duns earlier today I was greeted by people who were campaigning for a Yes vote – they are the first actual campaigners I have seen during the run in to the referendum. I watched the News and then walked Mix before bed. I had thought that today would be a gentle day in which I sat on a deck chair and listened to the cricket. In fact the cricket match between India and England passed me by totally (India won easily) but I did get involved in the Durham versus Nottingham match which will reach its conclusion tomorrow, both sides go into tomorrow with much to play for.